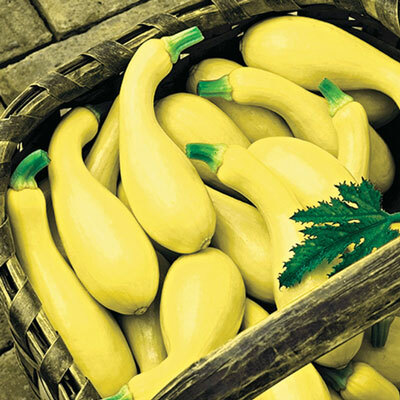 A yellow crookneck that produces heavy yields of excellent-quality fruit. Grows so fast that it "beats the heat!" First picking is only 41 days after seed is sown. Vigorous, medium-size bush is "well behaved." Has a strong open habit allowing air movement to pass through, which reduces disease pressure. 41 DAYS. For each offer ordered, get approx. 25 seeds per packet..
Spacing: 2 - 3 per hill, 4 - 5 feet between hills. Days To Maturity: 41 days. Soil Requirements: Well drained enriched soil. Fruit: The 5-6" long fruit is early-maturing, uniform, shiny yellow in color and holds well after picking.